The Skykomish River near Reiter Ponds Hatchery. 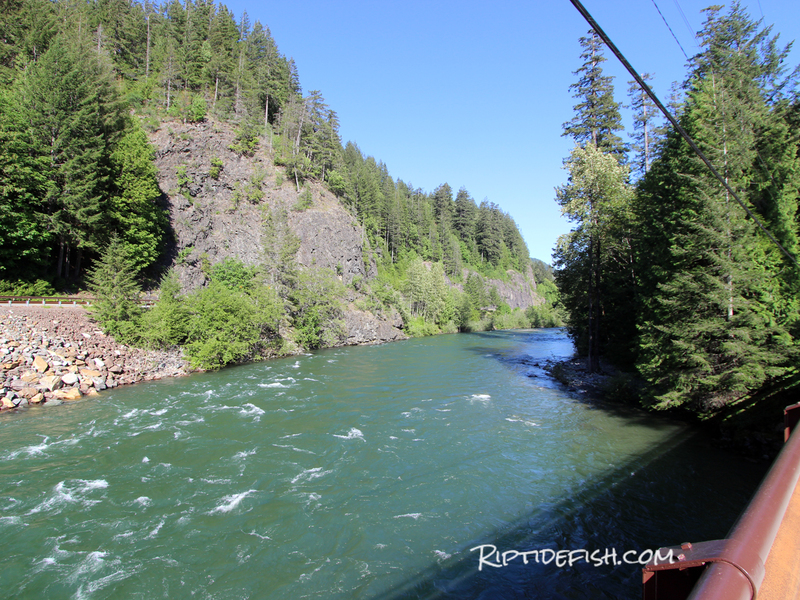 The Skykomish River is Seattle’s favorite Salmon and Steelhead River. 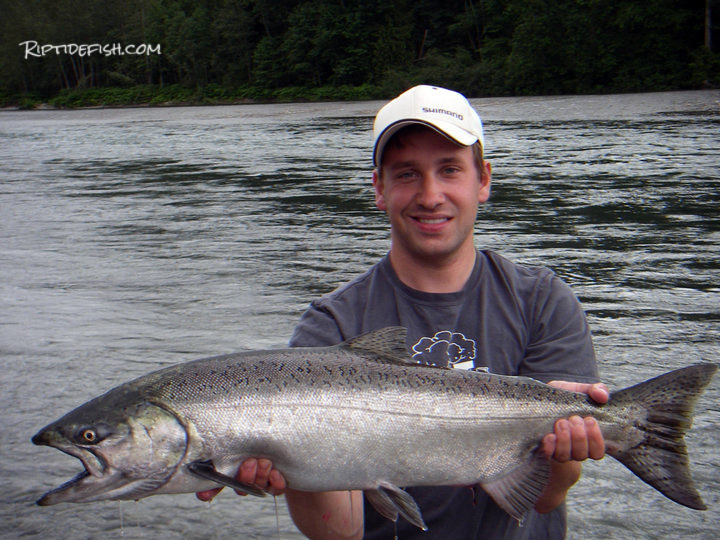 The Skykomish River is one of Washington’s most famous Salmon and Steelhead fishing rivers. Summer Steelhead, Dolly Varden, Pink Salmon, Coho Salmon, Chum Salmon, Chinook Salmon and Trout inhabit the river. If you are yearning to learn more about exploring the Skykomish River, then you are exactly the person I wrote this article for. Enjoy the river, there is plenty of water to explore. 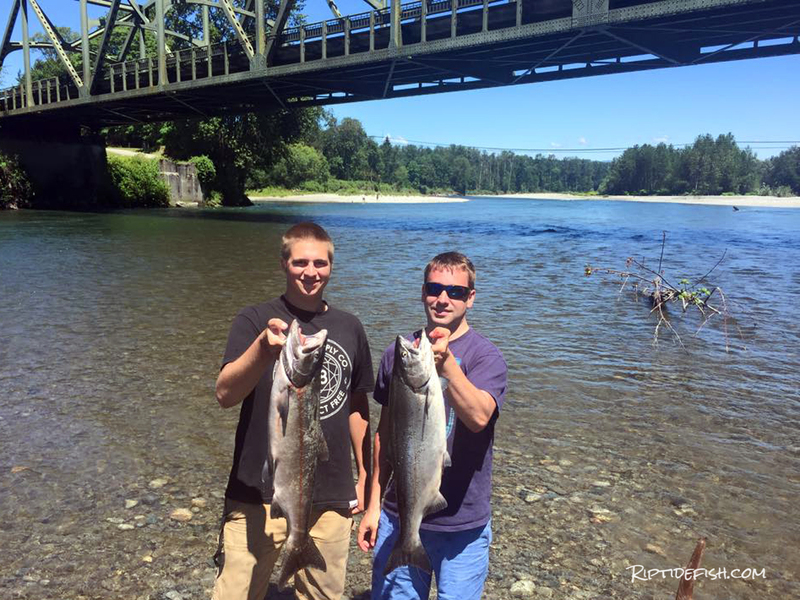 The Skykomish River during June and July are a fisherman’s paradise. The river is full of rainwater and snow melt and anglers catch hefty Summer Chinook and Summer Steelhead throughout the system. 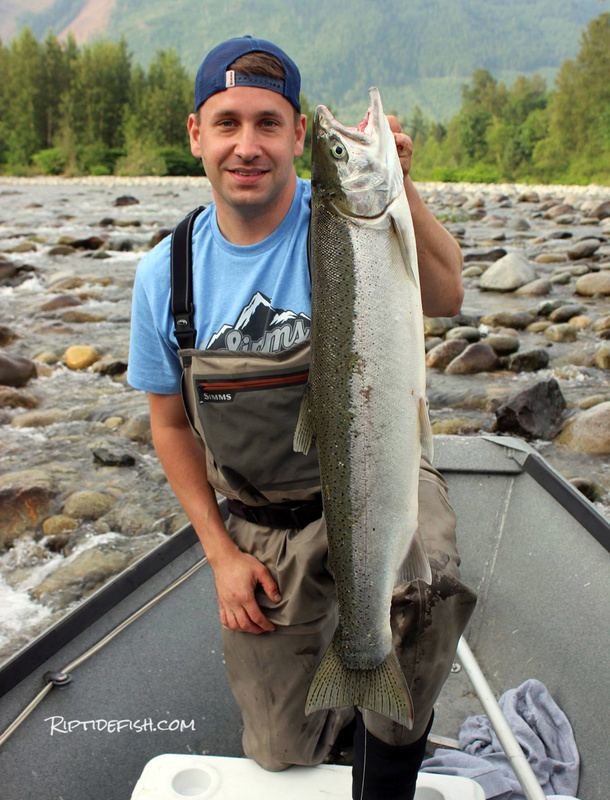 As with every species, check fishing regulations to see where you can keep Chinook and Steelhead in the Skykomish. Summer Chinook Salmon caught on the Skykomish River in June. 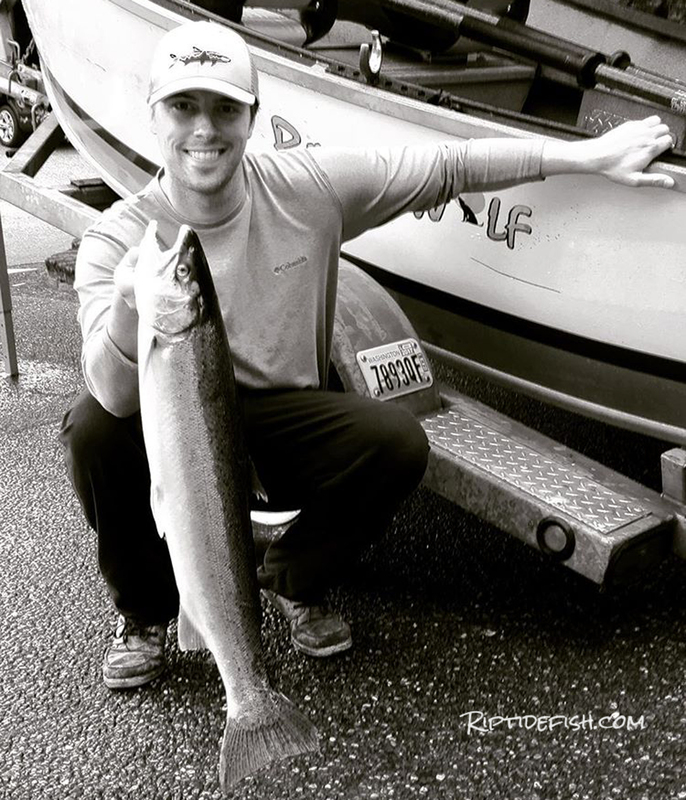 We see a good return of Salmon return to the Skykomish River during the fall fishing season. Pink Salmon are the first to show up in August through October, albeit only during odd numbered years (2019, 2021, 2023). 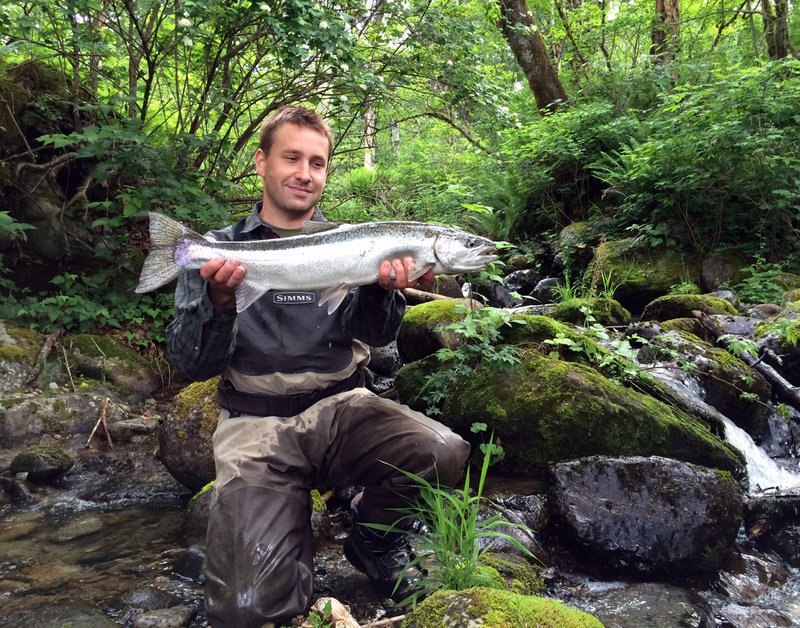 Coho Salmon are the most popular species and return to the river in September, October and November. 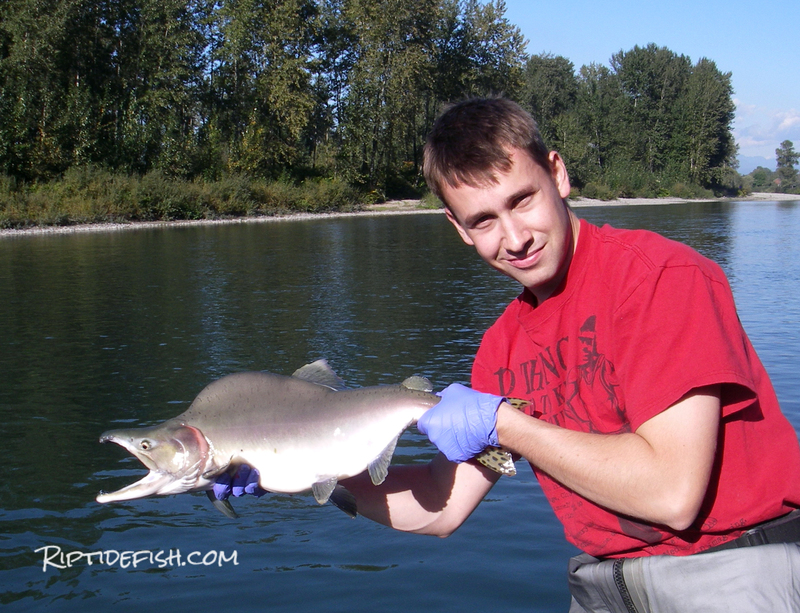 Chum Salmon are incidentally caught by Coho Salmon and Steelhead fishermen in November and December. Coho Salmon enter the Skykomish River in September and October. The Skykomish River is one of the best places to catch a Winter Steelhead near the Seattle metro area. This is exclusively a hatchery Steelhead fishery. There are wild Steelhead that return to the river, but at this point it closes before they show up in force to protect their recovery. The two hatcheries on the river are the Wallace River hatchery which plants a small number of smolt and the main Reiter Ponds Hatchery. The Skykomish River is one of the most popular areas near Seattle, Washington to fish for Salmon, Steelhead and Trout. There are a number of public boat launches and bank access points. Here are a few of the most well known fish catching spots. Tualco is a public access area just downstream from the town of Monroe. There is a primitive launch here but is rarely used but the drift boat and raft crowds. During low water periods, anglers will use this access point to hike up to the opposite bank of the Reformatory Hole. Pink Salmon bring a whole lot of excitement to the Skykomish River during odd numbered years. The reformatory hole is located off Monroe’s Main Street at 177th Street SE. The road hugs the river bank and a steep rip-rack rock bank gives access to a slow deep pool popular with fishermen during the Coho, Pink and Chinook salmon fishing seasons. Highway 203 travels south of downtown Monroe and in town is named Lewis Street. The Lewis Street Bridge over the Skykomish River is one of the most famous fishing spots on the Skykomish River. Bank access is available on both the north and south banks of the river. 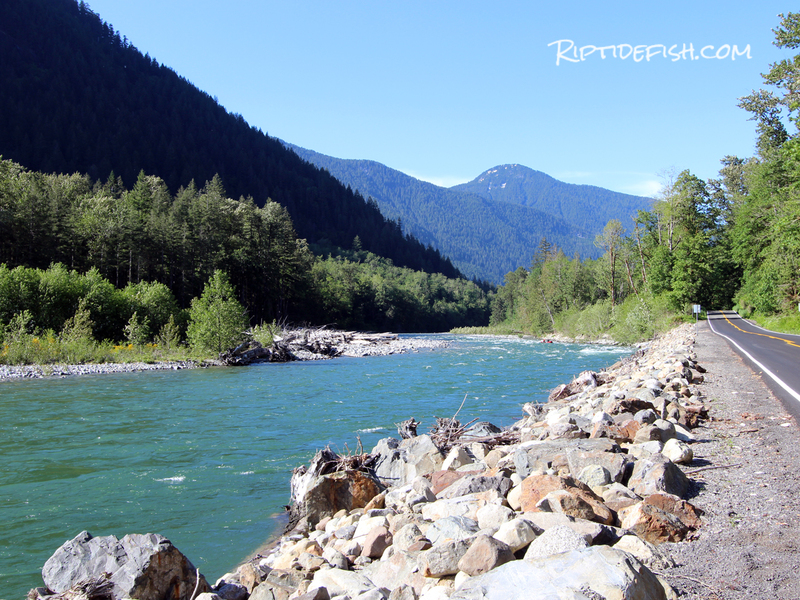 This is a great bank fishing spot and also it the location of the busiest boat launch on the Skykomish. Pink Salmon flood into the lower Skykomish in September on odd years. Al Borlin Park is located in Monroe upriver from the Lewis Street Bridge. A short hike from the parking area gives you access to a beautiful stretch of river. There is an old railroad trestle abutment on the upriver side of the park. This is a popular fishing area for Salmon and Steelhead in the summer and fall months. Ben Howard Road parallels the south bank of the Skykomish River from Monroe to Sultan. There is a public boat launch access point several miles east of the Highway 203 junction. This is primarily a drift boat and raft launch but does offer a sweeping gravel bar where anglers can fish for Pinks, Coho and Steelhead during lower water conditions. Several other pull-outs along Ben Howard Road offer good access to the river’s deeper holes. Josh with a July 4th Summer Steelhead caught between Sultan and Monroe. The Cracker Bar is a public access gravel bar on the bank opposite from the town of Sultan. This area is popular in summer, fall and winter. It is an easy place to fly fish, drift fish, swing spoons and bobber fish. Plenty of Chinook, Coho, Pinks, Chum and Steelhead are caught at Cracker Bar throughout the Skykomish River fishing season. The very first Skykomish River Chinook caught from my drift boat! The mouth of the Sultan River is the location of the uppermost boat launch where motorized vessels can be launched, but it is a very tricky place to get a jet sled in, launching a drift boat here is easy. Bank access downstream of the mouth gives us access to a deep slow stretch of river that holds Salmon and Steelhead. The Sultan River is one of the hidden gems of the Skykomish Valley. There is no salmon fishing allowed but can offer solitude for anyone fishing for Trout or Steelhead. Access is limited but there are a few public access spots near Sultan. The Wallace River is a small tributary to the Skykomish. The Skykomish River’s primary salmon hatchery is located here near the town of Startup. 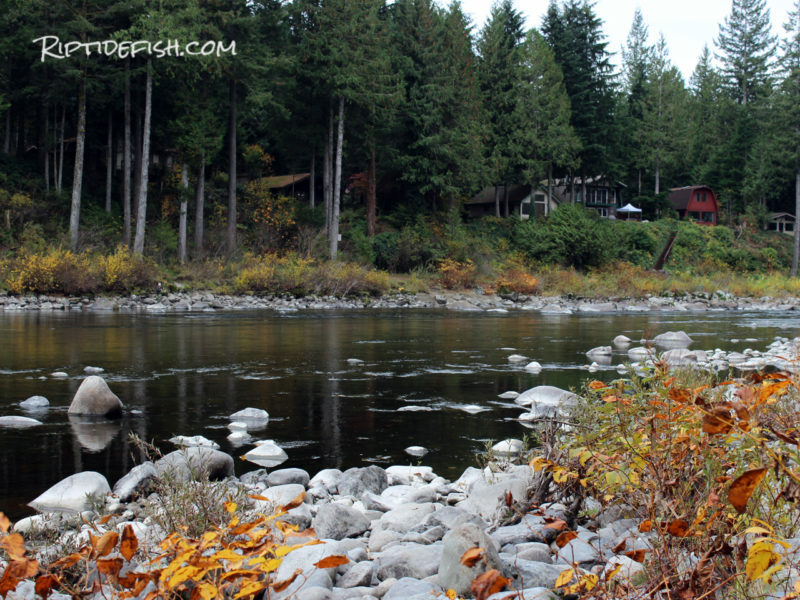 This is a popular fishing area during the fall Coho Salmon season and winter Steelhead season. 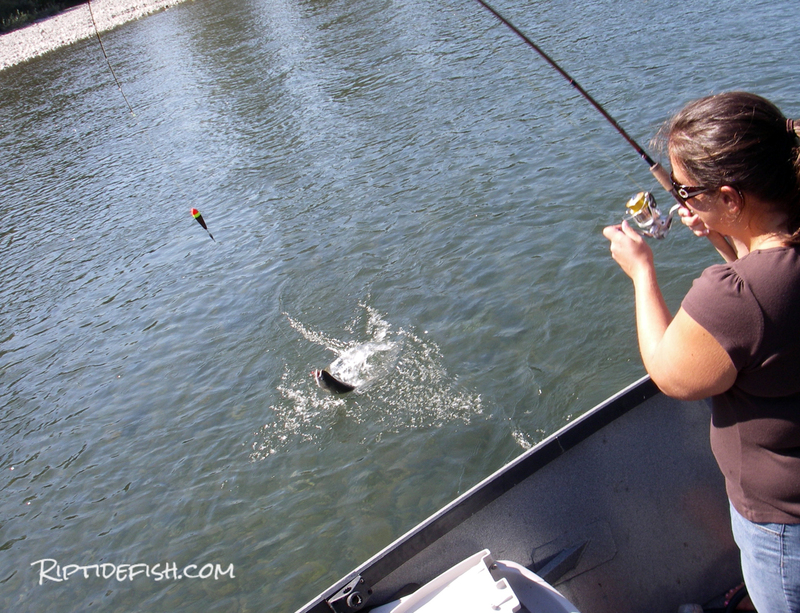 Float fishing with bobber and eggs is popular for Coho and bobber and jigs for winter Steelhead. There are a number of bank access spots along the river, the most popular being at the Wallace River state salmon hatchery. 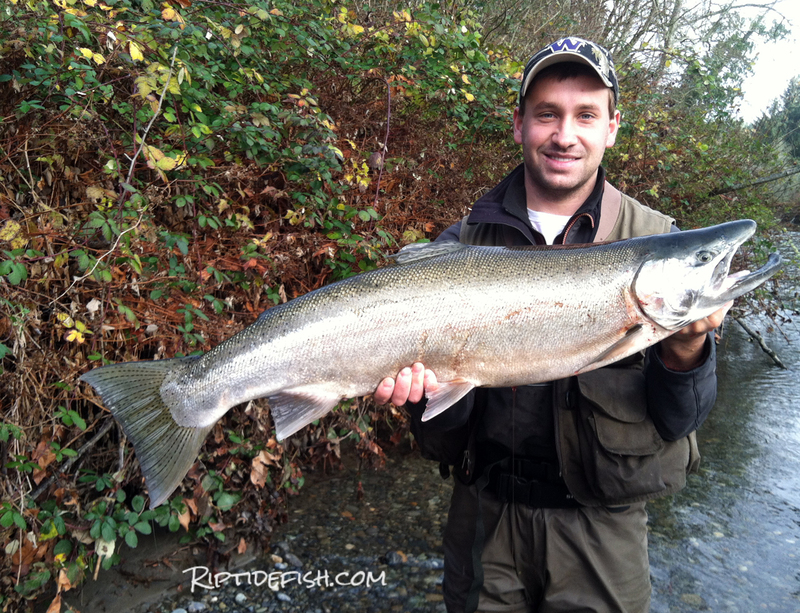 This huge hatchery Winter Steelhead was my personal best. Caught on the Wallace River in November. Proctor Creek enters the Skykomish River between High Bridge and the Reiter Ponds area. It is a small access point but popular during the summer and winter Steelhead fishing season. It is easy to spot because this is the only place east of Gold Bar where the railroad crosses over Highway 2 on a bridge. A small gravel parking area is under the railroad trestle. High Bridge Access is just east of the town of Gold Bar, Washington. The access point is mainly used by people launching their rafts, pontoons and drift boats but does have a little area where you can catch Steelhead from the bank. I caught this Summer Steelhead on the upper Skykomish River near Gold Bar, Washington. Cable Hole is one of the most well known Steelhead fishing spots on the Skykomish River and can be accessed from a trail that spurs near the Reiter Hatchery parking lot. 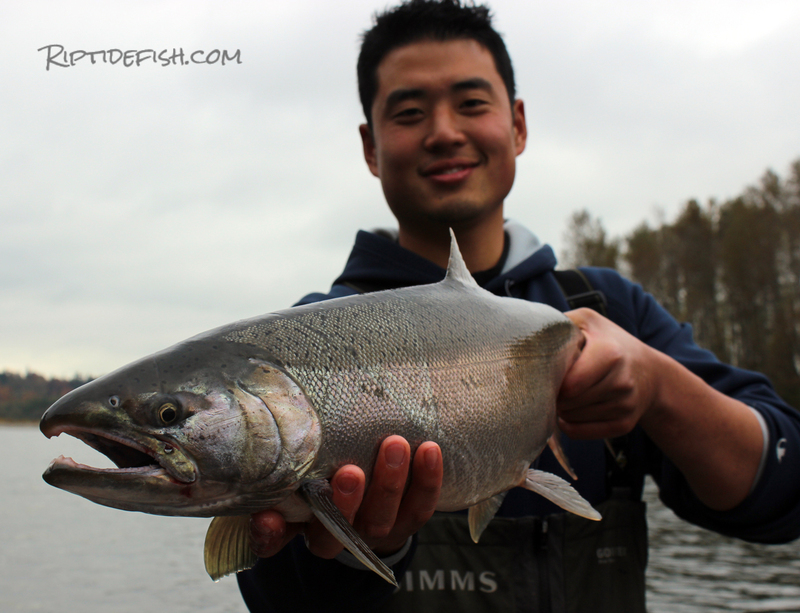 Great fishing for Summer and Winter Steelhead. Fish this when the water levels are low to medium. 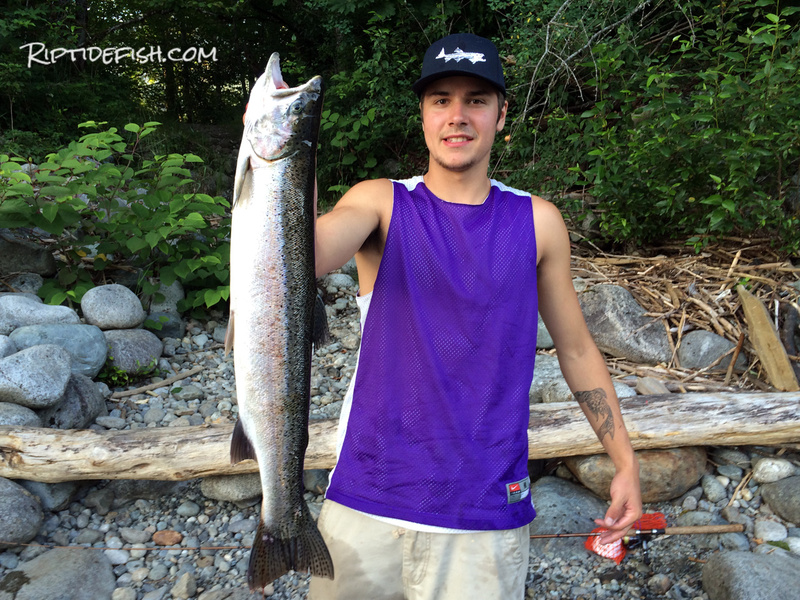 Mitch with his first Summer Steelhead of the season caught after work! Reiter Ponds is the most famous Skykomish River Steelhead fishing spot. This is the primary Steelhead hatchery on the river. Bank anglers here catch the majority of the river’s Winter and Summer Steelhead. This is a great place to fish with bobber and jig, swing spoons and drift fish. This is also the most heavily trafficked fishing spot on the river. My first Summer Steelhead of the season was a beauty. The Skykomish River from Reiter Hatcher upriver to the confluence of the North and South Forks of the Skykomish. There are beautiful stretches of river with slow runs and boulder gardens, all in the shadows of the Cascade Mountains. Access isn’t highly publicized but if you have a will to explore you can find some great water for Summer and Winter Steelhead. 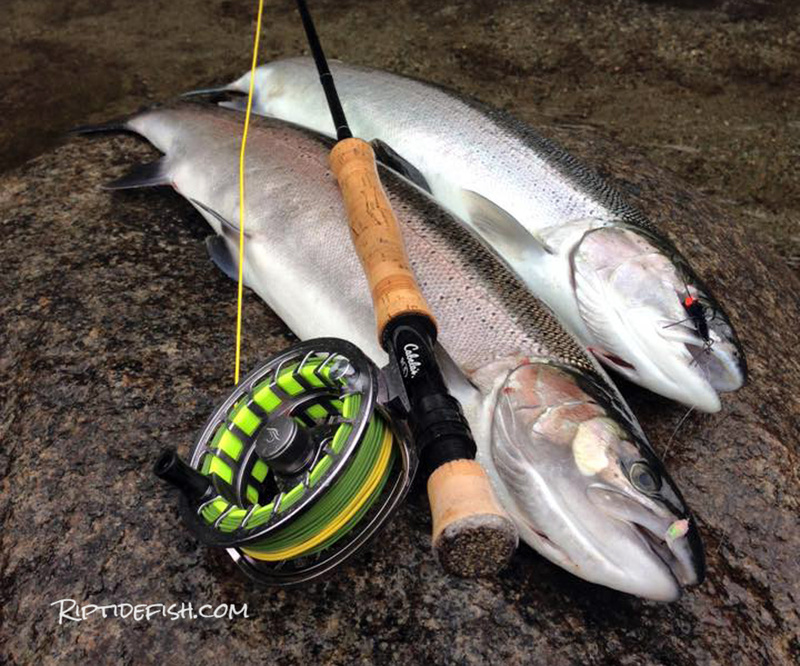 Fly Fishing for Summer Steelhead is the ultimate rush! Photo by Josh Palmer. The North Fork of the Skykomish River is truly wild country. Access here is extremely limited but the main access is the Index-Galina Road, which is mainly private property from the town of Index up 6 miles where the road is closed to vehicles. North Fork of the Skykomish River near the town of Index, Washington. Highway 2 follows the South Fork of the Skykomish River upstream from Index to the town of Skykomish. There are a few access points but is lightly trafficked by fishermen. Mainly a Summer Steelhead and Dolly Varden fishing area. South Fork of the Skykomish River near the town of Skykomish. Full of spring snowmelt.